According to me, letters and numbers put together are an instant formula to high blood pressure. Why should I have to stress what the values of x and y are just to reach a conclusion as to how many apples there are on a tree? My concern purely lies in the fact that will there be enough apples for a decent apple crumble or not. Yes I’m talking about algebra and yes I’m not mathematically inclined at all so algebra is one part of math that boggles my mind and makes me wonder who harmed these people who are intent on finding the value of x. Early this week, I had gone to my daughter’s school for the end of term parent-teacher consultations. I quite like the system of the school by the way. The report card is sent to you electronically before this meeting so that you may discuss the grades with your child and then pop into school to have a one on one with the teachers. I must say that where algebra is concerned my daughter is quite good with these logical deductions. Often during the term she would come to me with her homework and ask me to help her and one look at my stricken face, she would giggle and then attempt the problem on her and successfully solve it too. My curiosity got the better of me and one day I asked her to explain to me what it was all about and all I could do was watch her animated face as she talked about letters and numbers and how awesome they were to figure things out. I have seen that kind of look before. I have seen it in myself when I talk about my kids, my job, my artwork and people I love. That animation was very evident and I loved how she was trying to make me understand. She even gave me a few ‘homework’ questions to attempt and I must say I got one right out of three. Not bad, I thought to myself. Meeting her math teacher in school this week was quite a pleasure. He’s a lovely gentleman who is focused on helping build firm foundations for the children he teaches. Such dedication is really commendable because honestly speaking, in my time many of the teachers were just nasty ogres. I have no hesitation in saying that whatever subject I was weak in, instead of the teacher taking time out to gently explain to me, I always encountered frustration and yelling, and then the teacher moved on to continue teaching the more clever kids rather than helping me. 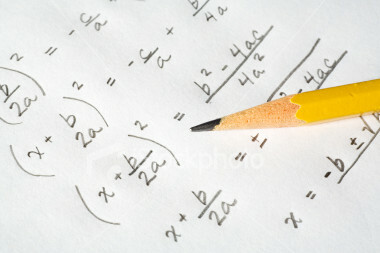 From a D or E grade in math I managed a B in GCSEs only because my math teacher in UK was wonderfully patient with me. I owe my mathematical skills to her. See what a bit of patience and attention can achieve? Coming back to algebra, people often joke where do we really use algebra in daily life but if you slow down to think about it, algebra is everywhere. From mixing ingredients for a cake to sending out a Tweet or making a phone call, there is some form of algebra involved. It is, simply put, basic logical skills. Why they have to put numbers and letter together will forever remain beyond me but with time I have realized that algebra is NOT a bad thing after all – as long as I don’t have to help my kids with their homework!